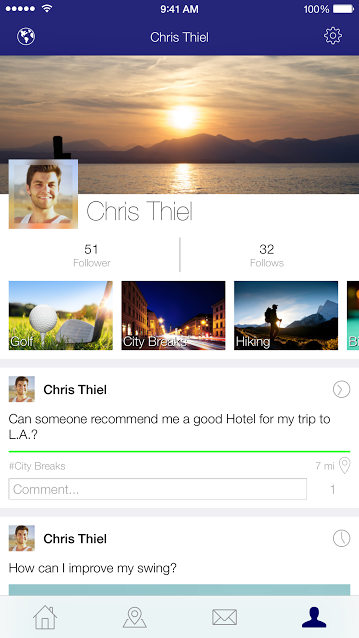 Is there room for another social network in your life? Inlope, a Munich, Germany-based startup which was founded last year and has just launched its app reckons so. And it’s not alone — having persuaded Microsoft to cover its costs for a year while it seeks to scale its idea into a living and breathing local social network. Inlope is not disclosing how much money Microsoft is handing over but CEO and co-founder Chris Obereder told TechCrunch this is not your typical investment for equity. Indeed, Microsoft is not paying to own any of the startup. Rather he described it as a PR move for Redmond, which will market Inlope via its own channels and gets to associate its brand with shiny startups and apps. Or that’s the theory. The app in question, with that rather unlovely name of Inlope — which stands for interests, local and people, in case you’re wondering — has just gone live on the iOS App Store, currently available in English and German. Obereder says Android and Windows Phone versions will come in the coming months, with support for the latter OS obviously being funded by Microsoft picking up Inlope’s tab — continuing its habit of paying developers to support its underdog mobile platform. So what exactly is Inlope? Sign up and you’ll be asked to share your location and then presented with a series of interest categories you can subscribe to — such as particular sports and activities, or political interests, arts, culture, technology and so on. Users can request a new category is created but these are moderated and Inlope won’t be allowing fuzzy categories like ‘silly cat photos’, says Obereder. There are, he says, more than enough online places to share that sort of stuff already. Once you’ve identified your interests the app will then pull in relevant posts from those categories, with the content you see filtered by distance — so you only see activity from other users in your town. The basic idea is to help people connect with likeminded individuals in their vicinity or neighborhood. “Local for us is the town, for example. At the beginning it’s of course distance sorted,” he adds. Users can post the usual digital suite of text, pictures and video to their interest groups within Inlope, much like any other messaging or social app. A desktop version is something the startup wants to do too, in time, according to Obereder, but it’s going mobile first. Interest-based you say? Well wouldn’t you know it, just last week Facebook broke out its Groups feature into a standalone app — in an attempt to burnish up what is undoubtedly a second-class experience, with Groups drowned out by the general social chit-chat which gets amplified on its primary platform. But still, the big FB is looking more carefully at micro-sharing, as TC’s Josh Constine termed it. Aka sharing stuff within siloed groups, rather than broadcasting it to all your fb friends. Which means this territory is not uncontested. However Obereder — a Rocket Internet alum and founder of two prior startups, among other past career moves — is not concerned about Facebook moving in on this space. “If we go against the big player — of course Facebook — then we stand out because they can’t focus on the interest part that much. They have the Groups but Groups are not really effective actually… In every big city there are like 100 groups for, let’s say golf, so I would have to join all the groups. There’s no one group, there’s no one platform where I can reach all the people who are interested in golf,” he says. When it comes to function overlap with other major social platforms like Instagram and Pinterest, where users can and do also coalesce around interests, Obereder says those services are focused on global communications — whereas Inlope is keeping comms local, so again offering something different. It’s certainly a logical idea, but the design of the app is not immediately compelling — with generic stock photos giving it a look that’s anything but locally flavored. Content is also at a minimum but that’s to be expected, given it just pulled the trigger. Still, social networks face a network effect challenge of attracting enough users before they become useful enough to be worth using. That’s presumably where Inlope is hoping Microsoft’s marketing muscle and money will come in. “We just launched it a couple of hours ago in Germany… and I’ve seen people posting things — a lot for example diving. I am also going diving and they are looking for diving partners next week, so people are using it,” says Obereder. The app is free to download and currently ad free. When the Microsoft money runs out he says the business model will likely focus on interest-based, local advertising. It might also look at ways to monetize by working more directly with the communities that use its platform. “We got approached by some German communities, for example a political community approached us and they said they want to use it for their members. They want to go away from Facebook, go on our platform and distribute their news on our platform. So we will work together with them,” he adds.